I don’t know about you, but I’m really excited. Why am I excited? Because today Square Enix launched their Final Fantasy XIV European data center. I know… I know! Final Fantasy XIV is really rather good. So good that it made our list of the top 10 MMORPGs on PC. Square Enix see the data center as a big investment, and invite European players to “feel the difference”. Rather than creating an entirely new World, the Chaos data centre, which has always been recommended for European players, will be moved to the new location. Expect three to five days of maintenece on that server while the job is completed. 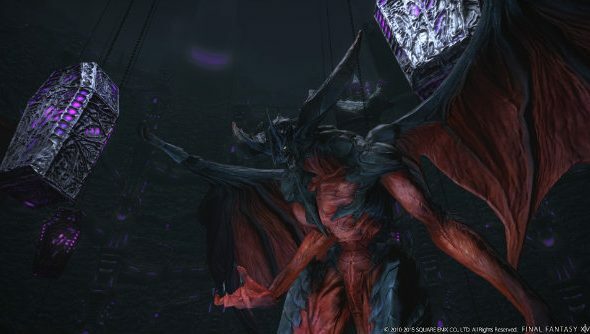 Service accounts containing characters on the Worlds within the Chaos data center (Cerberus / Lich / Moogle / Odin / Phoenix / Ragnarok / Shiva / Zodiark) before Friday, September 18, 2015 at 9:00 (GMT). Service accounts with an active subscription. Any character data saved on the Chaos data center will be automatically transferred across, so once it’s up and running you just need to log back in and play as normal. For players outside Europe who have characters on the Chaos data center, Square Enix ask that you try it out. If you experience latency issues, you will be allowed to transfer from Worlds within the Chaos data center to Worlds within the Elemental, Gaia, Mana, Aether, or Primal data centers free of charge for one week. The free World transfer service will not apply to characters moved from the Elemental, Gaia, Mana, Aether, or Primal data centers to the Chaos data center. If you are reading all of this with a single eyebrow raised because you have no idea what I’m talking about, you can grab a free 14 day trial and try it Final Fantasy XIV out.